After a good experience with the Imperial Radch trilogy, I'm an easy sell for sentient spaceships as the lead character. 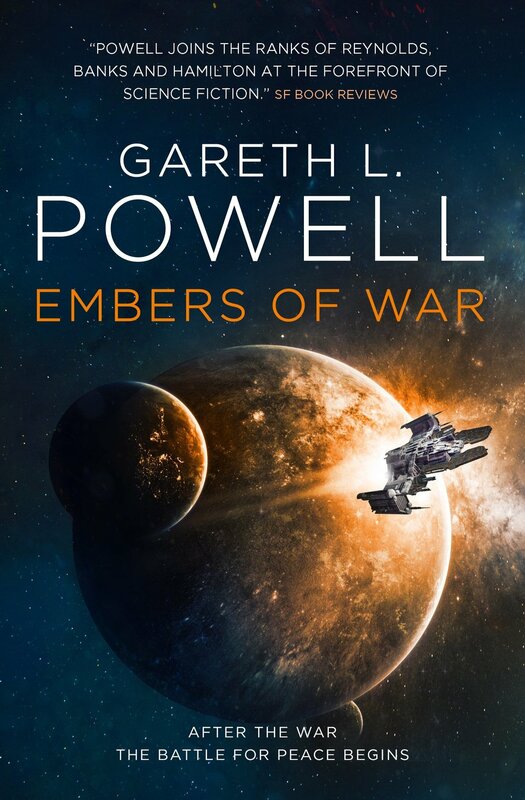 Consequently, it's not surprising that the description of Gareth Powell's Embers of War caused me to walk happily out of the bookstore. Embers of War follows the Trouble Dog and her crew. Trouble Dog, a former military vessel, now seeks to redeem herself by working for the House of Reclamation, which rescues ships and passengers in distress. 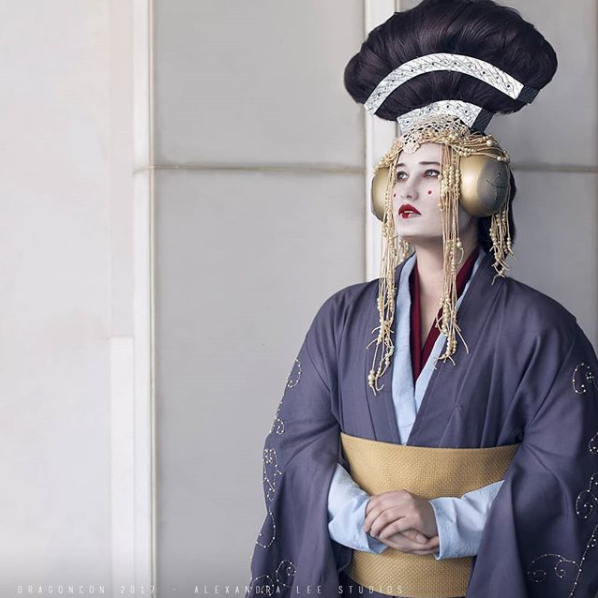 Her crew have similar backgrounds, all of them tied to one or another side of a recent war that resulted in the obliteration of a sentient forest. When a civilian liner goes missing in a disputed star system containing some weird objects, Trouble Dog is dispatched to rescue the crew. Except this rescue mission is anything but straightforward, and a galactic war might be brewing. Powell does a really nice job of stacking his characters around a core event. Just because a war has ended doesn't mean its effects are gone; they last well into the years following the start of peace. The book opens with the horrific end to a war, and then, accordingly, all of Powell's character struggle with how to deal with that event, how to reconcile what they did or didn't do, what they saw and experience, with a return to their everyday lives. Trouble Dog herself and Ona Sudak are the most extreme examples, but it's there even in the secondary characters. Not surprising, then, that Trouble Dog and Ona Sudak were the characters I enjoyed the most. Trouble Dog is seeking redemption for her actions, and while that remains important to her, she also can't run away from what she is: a predator. It's how she uses those skills that becomes important, particularly in the climax. Ona, meanwhile, just wants to hide and possibly forget (or at least, let the world forget about her). But she comes to realize that there is no hiding from our pasts. We have to embrace who we are and then work to be better. The other characters weren't nearly as compelling. Sal is probably the next tier down. Sal is basically on probation for most of the book, but she handles her situation with a considerable deal of grit and mostly makes the right calls. The death of a character early on hangs over her for most of the novel, an ever-present reminder of what happens when she fails. All of them are seeking redemption, so the book's themes feel cohesive. Most of these characters feel like underdogs, so we want to root for them. Now, my biggest complaint. Embers of War started pretty slow for me. The opening was super promising, but then the pacing took a nose dive off a cliff. Even things that should have been terribly exciting, like the civilian spaceship crashing near the beginning, didn't really seem to land with the impact they should have. I was missing something to keep pulling me through, something that made me want to keep reading it, let alone that special je ne sais quoi that keeps you turning pages until suddenly it's 4AM and what happened. It took me an awfully long time to get through the first half. Fortunately, about halfway through the book, things pick up considerably. Once Trouble Dog and her crew leave their resupply to head toward the system where the liner disappeared and once we start following Ona Sudak as she explores one of the mysterious Objects, the plot suddenly becomes a lot more gripping and the pacing picks up considerably. From there, we get to a super memorable climax. I was particularly fond of Trouble Dog's encounters with her former pack, and the revelation of what lurks inside the Objects of this old system. It's a good use of foreshadowing on Powell's part. And now's a good time to say that there's good worldbuilding here, but it feels buried at times. The Objects (the name made me groan) are interesting in and of themselves, and I wanted to learn more. There are moments of exposition that shine, like the story of Sal's ancestor who started the House of Reclamation. But then there's the space nations like the Conglomeration (I cringed at that one too) who are fighting because...reasons? I mean, there's reasons given but they seem kind of flimsy. So at the end of the day, I graded this one where I did because I liked it. I didn't love it, but I liked it. It was entertaining, the ending provided enough intrigue to get me to read a sequel, and the themes are well done. That's good enough to earn it a recommendation; just beware the pacing. I had been built to accept casualties among my human charges, to easily adapt to changes int he command structure. Forming attachments was not meant to be one of my primary skills; it was something that had developed slowly over time. An unanticipated side effect of my heritage. Now, I was human in every respect that really mattered.